Excellent organization and tour guides. The reason I'm giving this a 4-star rating is because the last stop on the itinerary, Kiyomizudera Temple, is currently under renovation. While the views from the temple can still be enjoyed, there is no view of the main temple at this time. I would recommend to replace this part of the itinerary with something else for the time being but that's just my personal view. The personal service we received from the tour operators was great including transfers in Tokyo and Kyoto. The itinerary is ambitious and may have been a bit too much. Unfortunately the sites visited were extremely crowded and at times the tours felt somewhat rushed, however the guides were very good. It's a nice 2 day tours but it can be done a bit better and if lunch can be included, it would be wonderful. Enjoyed seeing Kyoto. Wish we had booked one more day. Loved this trip!! I stayed in Gion Yoshi-ima a Japanese-style hotel and it was one of my favorite experiences from my stay in Japan. The house was beautiful, my room faced the garden and I got my exquisite dinner and breakfast served in my room. I highly recommend it. Although the sights were great I felt as though everything was rushed. Often the tour guides would start talking before everyone in the group was at the same point. Honestly, that really bothered me. These are expensive tours and the tour guides need to have the courtesy to wait for the group to give an explanation. 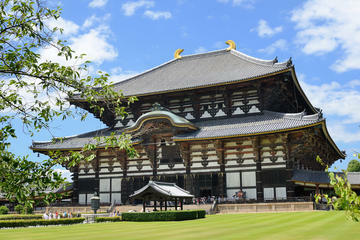 Nara was awesome and our tour guide was amazing, totally recommended! The overnight in the Japanese style hotel, so wonderful, what a great experience! The afternoon tour for Kyoto was also awesome, very cool stops - although some were too crowded. The morning tour for Kyoto was too rushed, not fun. organized in an excellent manner, very experienced and polite guides, planned to the minimal detail. I felt very safe and well accompanied, excellent bus and bus driver. The places visisted were extremely interesting, pity that the masses of toursists and students made it hard to walk and see and that the atmosphere could not be enjoyed. Students should be told to be less loud perhaps?